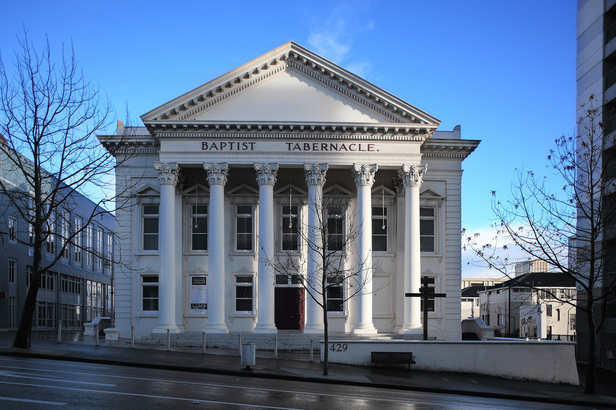 The Auckland Baptist Tabernacle buildings occupy an acre at the top corner of Queen Street and Karangahape Road. The new Tabernacle Trust building was opened in 2005. (The original Trust building dated back to 1908). 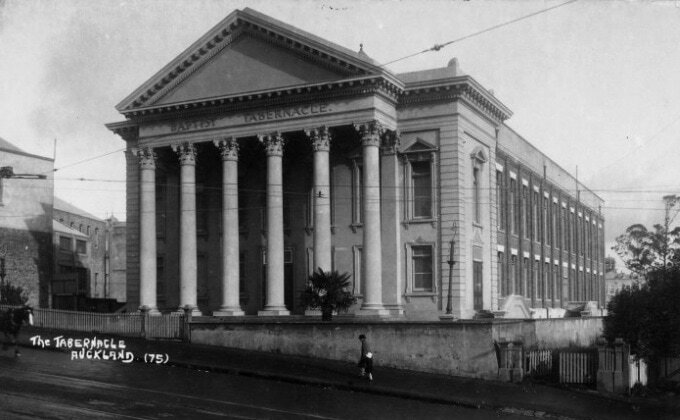 Since its opening in 1885, the classical Corinthian facade of the church building has been a landmark at the top of Auckland's main thoroughfare, Queen Street. The portico is supported by six massive pillars each about 8 metres high, standing at the top of a flight of steps 15 metres in width. The front (now painted Spanish white) extends on each side of the portico by a further 3 metres. Ornate plasterwork frames the opaque ground glass windows, and forms quoined "stones" at the angles of the facade. Behind the six pillars the solid pair of wooden doors are 2 metres in width. They open outwards, as do similar panelled and moulded side doors. The exterior brick sides of the building are subdivided by plain pilasters, with a moulded parapet above. The side windows on two levels are stained glass. The roof, originally of slate, is long-run iron. Beyond the main doors, a small foyer varies in width as it follows the circular wall of the auditorium. At either side easy and spacious stairs rise to balcony level. These are finished with wrought iron balustrades and cedar rails. The ground floor (20 by 28 metres), and the balcony of the auditorium once seated 1,150. There are now 700 seats because of the extension of the carpeted platform of two levels. At the rear of the platform a high arching alcove is surrounded by ornamental Corinthian detail. In this alcove the oak-paneled pipe organ was installed in 1913. The horseshoe gallery is supported by elegant cast iron columns and faced by a beautiful curving cast-iron balustrade topped with a polished cedar rail. The balustrade is richly tinted in brown and gold. The kauri-paneled ceiling of the auditorium is coved in the angles, moulded at the top and bottom. Panels are divided by the full-width tie beams which are the bases of immense kauri trusses supporting the roof. The mouldings and angles of the panels are finely painted in neutral tints picked out with gold, edged with beadings, with foliated rosettes at the intersections. Decorative stenciling was added by the well-known early New Zealand painter Charles Blomfield, who was a member of the church in the 1880s. Five of the panels have ornamented centres from which the original gasaliers were once suspended. The auditorium is now lit by seven chandeliers and modern down lights. The rear half of the building, four levels of less interest architecturally and historically, is dedicated to social, ministry and training functions.